Do you plan to capture BTS for your next wedding shoot? Behind the scenes are important for the couple. Most of the photos for the BTS shoot can be taken during ceremony rehearsals or at the home during preparations. In this guide, we will share how to shoot behind the scenes wedding photography. There’s a lot to shoot during a bride getting ready. The laughter, teasers and fun created by the bridesmaids and friends of the bride will give you great photos. You can shoot the props, dress, jewellery, ring and any other wearable item available in the prep room. The mirror shots of the bride getting ready will be amazing. However, you can also make small video clips that can be compiled later in an amazing video. The fun in this room is beyond explanation. You will see the amazing bonding, understanding and humor that will give you a lot of time to take photos. It is recommended to shoot without disturbing the gathering, so you can get the original behind-the-scenes effect without it looking staged. As a wedding photographer, you may have signed the contract with your client. In the discussion with the couple, you may have talked about the family and important people to shoot for the album. Starting from parents to siblings, you should also capture close friends and relatives. It’s better to capture candid photos without them knowing. We recommend you to avoid using flash, so no one will know that you are taking photos. A second shooter will help a lot to capture behind the scenes. 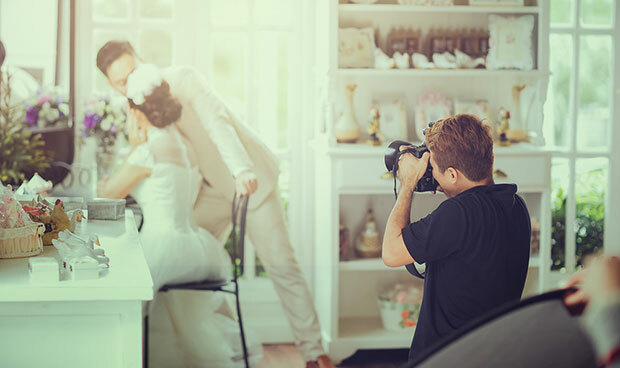 While you are preparing a pose for the couple, the second photographer can shoot this preparation. The other photographer can also stand behind you to capture the scenes when you are shooting something important. All these photos and videos will make an amazing film of behind the scenes of a wedding. You will need short video clips for a cinematic video or teaser. 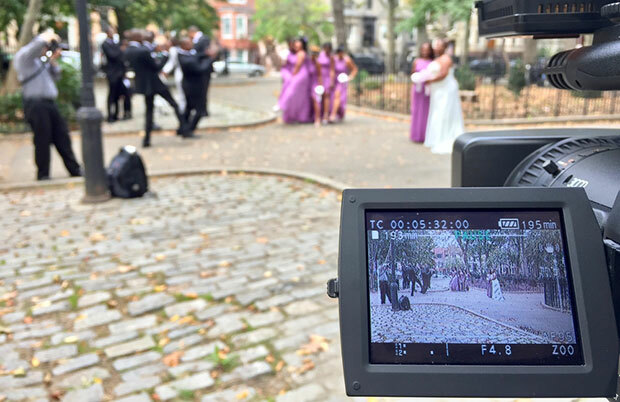 It may include photos, but the small videos that you capture during the wedding ceremony are important. The interviews from the parents of bride and groom, their friends and siblings will add a great value to the teaser. You should capture humor and emotions that can help in creating a successful behind the scenes video. The photos can be delivered separately to surprise the couple, and they will be impressed with you work. These gestures are also important for you to get more work as a wedding photographer. That’s all. We hope this guide has helped you to learn how to shoot behind the scenes wedding photography. You may also want to check out our guide on tips for shooting a themed wedding. Do you have a photography website? You should check this easy guide to speed up your site’s performance. If you like this guide, then please follow us on Facebook and Twitter for more free wedding photography tips and resources. Which Camera is Best for Wedding Photography? How Many Images Should You Shoot During a Wedding?